By The Beach - Salt Rock Accommodation. By the Beach, luxury self-catering holiday home, sleeping up to 10 persons on the North Coast of KwaZulu-Natal. It is a flat 150m walk to the Main Salt Rock Swimming Beach, which is protected by shark nets and life guards. Airport Transfers to and from Salt Rock will be provided on request. The house consists of four bedrooms. There are two large main double bedrooms. Each has en-suite showers and one has a spa bath. The third bedroom has a double bed plus a single bed, has sliding doors opening to its own private garden area. This room adjoins a long, dormitory style room which has three single beds which have "pull out" beds underneath (ideally suited for children). These rooms share a shower en-suite and large dressing area. The large, modern kitchen, with separate scullery, is open plan to the spacious lounge and diningroom. Sliding doors and windows open out to a covered outdoor entertainment area - wonderful for outdoor breakfasts, braais/barbecue or simply enjoying the views of the sparkling rock pool and tropical garden. The stream at the far side of the garden is lined with tall indigenous mangrove trees, which provides a private, serene, relaxing ambiance and protection when the beach gets too windy. Although close to the beach, the house offers no sea-views. All rooms have overhead ventilator fans. Aircons on request (please ask for info). A satellite TV and DVD player, is connected to DStv full bouquet. The house is serviced daily excluding weekends and Public Holidays. Weekend and laundry services on request. Walking distance to Salt Rock shopping centre, library, restaurants and pubs. 5km to Ballito and Umhlali Village for shopping and banks. 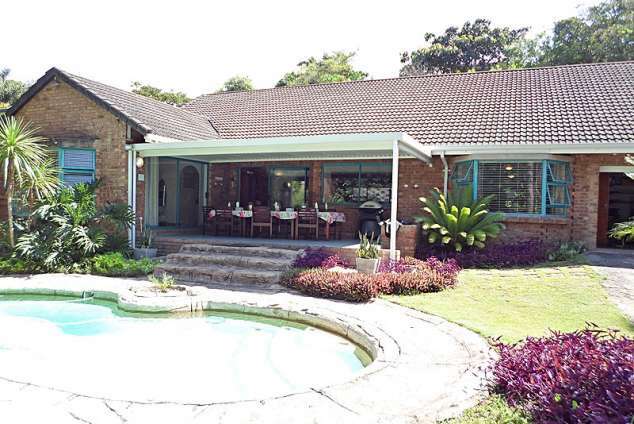 Close to Prince's Grant and Mt Edgecombe Golf Courses. Walking distance to Salt Rock Hotel and Country Club (bowls and squash). 3km Umhlali Country Club which caters for golf, tennis, bowls and squash. Beach - (netted bathing beach) swimming, surfing, diving, fishing 150 meters away. Salt Rock Tidal Pool and rock pools (wonderful for small children) 200 meters away. Flagfarm, an animal farm for kids (5 minutes drive). Horse riding in the endless sugar cane fields (5 minutes drive). Crocodile farm and Reptile park, quad bike trails and paint balls (5 minutes drive). Microlight landing strip offering scenic flights along coastline (10 minutes drive). Hospitals, doctors and chemists close by. 15 minutes from Sibaya Casino and Entertainment Kingdom. 25 minutes from Gateway Shopping and Entertainment Centre - the largest in the Southern Hemisphere with numerous restaurants, 16 movie theatres, Imax and the Barnyard Theatres, Tenpin bowling and children's games arcade, 4x4 Trails and the Wavehouse and skateboard park. One hours drive to Valley of 1000 Hills and Shakaland. Two hours drive to the Hluhluwe-Umfolozi Game Reserve with it's Big 5 having both the white and black rhino. 40 minute drive to Durban International Airport. Deep Sea Fishing off local shores - Durban harbor. We would love you to visit and experience the tranquility of the lush North Coast whilst enjoying the hospitality of our much-loved family beach house. If you are driving on the N2 North you take Exit 214 - Umhlali / Salt Rock. Turn right - cross over the freeway towards the beach. Drive approx 3 km and pass shopping centres, then Salt Rock Hotel on left side. 2nd road to your right after the Hotel is Garden Road (Glen Eagles flats on the corner and directly opposite Salt Rock Main Beach). Approx 150m, 3rd house to your left you will find By The Beach, 12 Garden Road. Detail description : Family Establishment, home away from home! 112978 page views since 04 Sep, 2006.